The triceps really are one of the most visually impressive muscle groups in the human body. Larger than their opposite number, the biceps, they are responsible for adding major bulk to the upper arms. Well built triceps are essential for any serious physique athlete. The triceps sit at the back of the arm like a huge, hulking horseshoe of muscle. They give one of the most satisfying pumps you can get in the gym as they swell with blood and sit stubbornly against the muscles of the upper back. You’ll have a hard time finding someone who doesn’t love training their triceps and stretching the sleeves of their shirt. But, like or love triceps training, most people do not train them effectively enough to reach their full potential. This is not to say they are doing too few sets, in fact overtraining is one of the biggest downfalls of many lifter’s arm training regimes, since the arms muscles are used extensively in virtually every other exercise in the gym. A lot of people’s triceps training simply lacks variety. The triceps are called that because they are comprised of three separate muscle heads: the lateral head, long head, and the medial head. Let’s break this down. The lateral head is the showiest of the triceps muscles, it is the one that gives the sought after horseshoe. It is most effectively stimulated by movements involving the upper arm remaining by your side, such as press-downs. 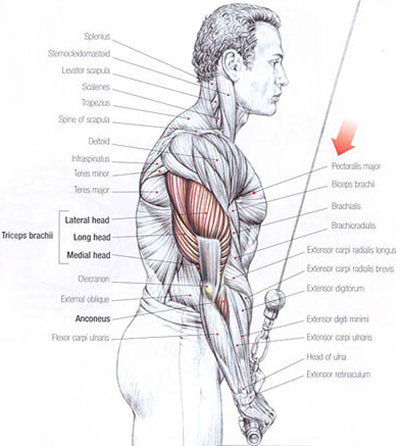 The long head makes up the bulk of the triceps, so it is the main contributor to overall mass. It is effectively hit by overhead movements. The medial head is a slightly deeper muscle that lies in the center of the triceps. The best training method for this muscle is any exercise that involves lying with your arms out in front. While all three heads are hit in some way when performing any weighted movement involving elbow extension, it is clear not all exercises are created equal regarding all-around triceps development. The best method for training the triceps is to begin by targeting the strongest and largest segment, the long head, before blasting the medial head, and finishing by burning out the horseshoe shaped lateral portion of the muscle group. By the time you have finished, your triceps will be blown out like balloons. To increase this effect, add in Sheer NO2 Nitric Oxide Booster. This amazing supplement boosts natural nitric oxide production causing increased muscular blood flow, leading to super freaky pumps. If there is one exercise that most effectively places stress on all three heads, it is the close-grip bench press. This exercise is the most effective mass building triceps exercise due to its compound nature and the relatively large weights involved. The main mistake made with this exercise is using a too narrow grip. Extremely close grips (it’s not uncommon to see hands touching in the center of the bar) place marked strain on the wrists and elbows, as well as restricting the range of motion. Instead, you should use a grip with at least 8-10 inches between the thumbs, somewhere closer to shoulder width. Eliminate the involvement of the chest muscles as much as possible by avoiding puffing the chest out (as you would with a standard bench press) and keeping the elbows tight to the body. Begin by unracking the weight and holding it at arm’s length. Now inhale as you slowly lower the bar to a natural position somewhere around your lower chest. Press the bar upwards, exhaling as you do so, and try to place as much strain on the triceps and as little on the chest as possible. Another bench press variation targeting the triceps is the board press. This exercise has long been used by powerlifters to improve their lockout strength but is great for developing triceps strength and size as it largely eliminates chest involvement. Board pressing involves exactly what the name suggests, bench pressing with boards. These particular boards (usually 5 or 6 2×4’s or similar) are fixed together and placed on the chest, where they are held by a training partner. With a grip somewhere between a standard bench press and the close-grip variety, the bar is lowered to touch the boards before being propelled upwards with the triceps. The only downfalls of this exercise is it requires a pre-fabricated board and two spotters. Any overhead extension exercise targets the long head. There are a few variations of this lift, but the most natural and effective is the overhead dumbbell extension (pictured). This exercise is best performed seated to support the back and eliminate the urge to use momentum. Choose a dumbbell of suitable weight and sit with it in your lap. The best way to get the weight to the start position is to place it upright and hoist it to a shoulder before up to arm’s length. Keep your head up, looking forward, as you slowly lower the weight behind your neck. Briefly feel the strain as your elbows reach 90 degrees before straightening the arms and propelling the dumbbell skywards. This exercise can be performed with a barbell, but always use an EZ curl bar rather than a flat bar to avoid injury. Using a cable set-up is effective for this exercise as it eliminates the dead spot at the top of the movement. You may wish to perform the cable variation standing up and leaning forwards with one foot in front of the other. Skullcrushers, or lying triceps extensions, are a big favorite in the gym and hit the medial head hard. As the video explains, do not lock the elbows out at the top, or you risk damaging the joints. NEVER perform this exercise with a flat bar! It feels unnatural for a reason… it is! EZ curl bars all the way here. 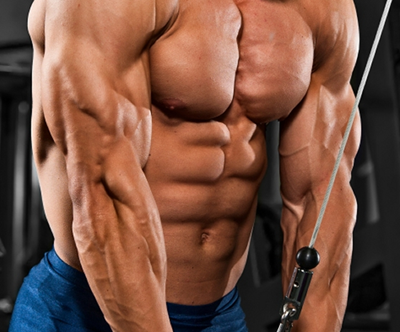 Keep your upper arms rigid and still, lower to the forehead, and build huge triceps. Now for another great, compound exercise that blasts the triceps with high-intensity work. All three heads are targeted, with much work being done by the lateral and medial areas, with this old school, bodyweight classic. Now forget those horrible bench dips you used to do at school, the position used for those is just plain bad and places massive strain on the elbows and shoulders. Instead, use a parallel bar set-up or dip station (pictured). Keep your body relatively upright to maximize the work done by the triceps. Leaning forwards heaps pressure on the larger and stronger chest muscles, leading to a less effective workout. Lower slowly until your elbows are at 90 degrees. Feel the strain and avoid letting your shoulders hunch excessively. Push powerfully, returning yourself to the start position. To get yourself fired up for training and avoid flagging halfway through, you should add a pre-workout supplement to your stack. Sheer Strength Pre-Workout is an excellent supplement, packed with scientifically proven ingredients to boost your energy, focus and drive, without giving you the dreaded jitters. The added creatine monohydrate also provides improvements in strength and protein synthesis. Now let’s start sculpting that horseshoe with triceps kickbacks. This exercise is often labelled as ineffective and useless, and while it won’t add any serious belly to the muscle, it will provide shape and size to the showy, outer area of the triceps. Begin with a knee and hand resting on a bench, take a dumbbell, bring the upper arm up and back, so it’s parallel with the floor, then extend the arm backwards, allowing the lower arm to follow a natural curve and twist. Squeeze for a second at peak contraction before slowly lowering. Using a cable is extremely effective for this exercise as it eliminates the dead spot at the bottom, keeping constant pressure on the target muscles. The best grip for this is to remove all handles and hold the rubber ball stopper. Cable press-downs are a superb way to finish the triceps, and sculpt that aesthetic outer head. The various handles available allow you to mix it up and hit the muscle from all angles. Don’t forget to add in an underhand grip variation from time to time to blast the deep medial head. Plant your feet a short way from the cable station, lean forwards slightly from the hips, fix your upper arms in a position perpendicular to the floor and extend. The only parts of your body that should move at all are your lower arms. When your workout is done, and it’s time to head for home, you want to kickstart the rebuilding process as soon as possible. Sheer Recovery is a great supplement, packed with all the little extras your muscles could need to begin growth. Taken along with a quality protein shake, provides the building blocks you need. The post Top Lifts for Huge Triceps appeared first on .